French Onion Kale Chips. Do I need to say more? I absolutely love onion and ranch flavored chips and when I made these I was going for a real onion flavor. No posers here. Kale makes an amazing chip and for anyone that’s not sure about kale it’s usually smoothies or kale chips that finally win them over. It’s just the way it is. 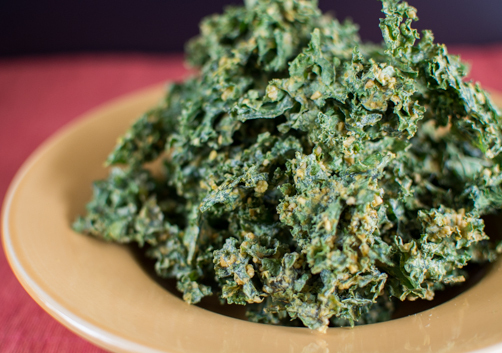 Kale chips are light and crispy and if you don’t spread them out really well you end up with concentrated clumps of flavor – so don’t spread them out really well. 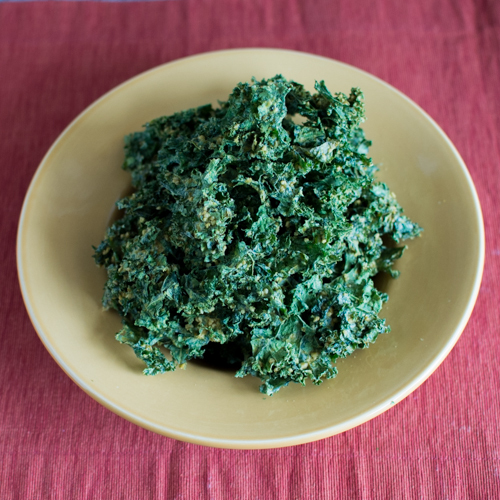 I have exactly two kale chip recipes currently on Feed Your Skull, which is almost embarrassing for I love kale chips! If you’re interested there’s the popular Tahini Kale Chips and Munch Crunch Onion Flax Kale Chips—both are from the early days of FYS. 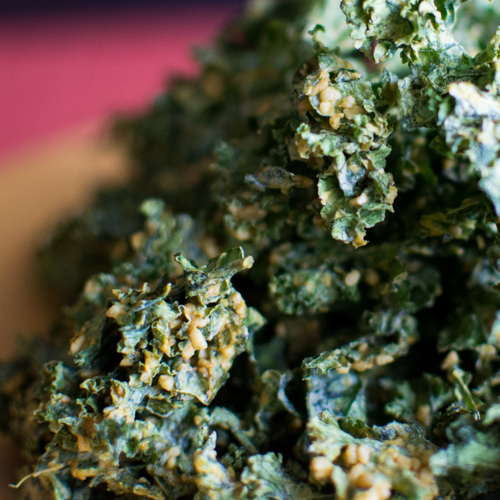 One of the reasons I haven’t created many kale chip recipes is that I always thought oil was needed to make kale chips. That usually means oil plus nuts which is just too much in my opinion. 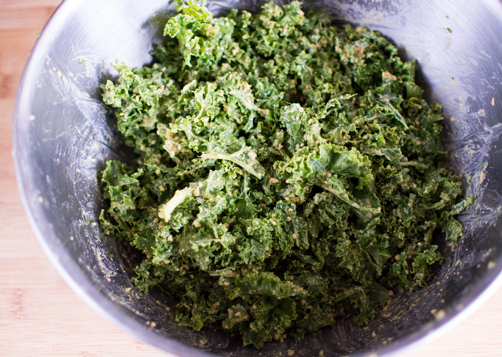 During the last year I’ve been very interested in cutting back and even eliminating oil use in cooking so when I went to make kale chips last week I was excited to develop a recipe that didn’t need any oil. These chips still contain fat from sunflower seeds but they are a whole food source and have an added benefit because they are cheaper than other nuts and seeds. 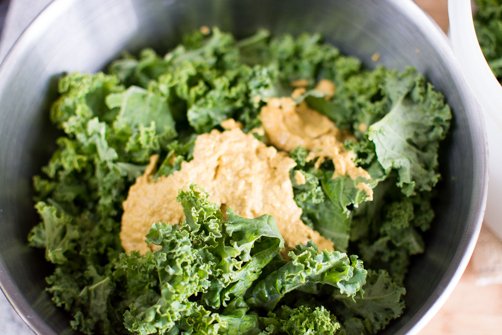 I use gloves to mix the kale and dressing for quick and easy clean up. The chip ‘coating’ would also make a great dressing. What my trays look like before dehydrating. As the moisture is removed – the kale shrinks back quite a bit. Once kale is de-stemmed place it in a large bowl or 2, if needed. 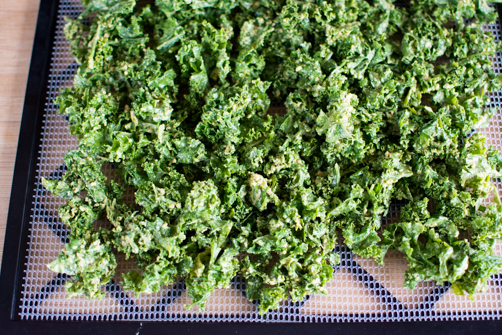 Pour over the kale and using your hands (or tongs) rub the mixture into the kale until every leaf is well coated. Spread out on dehydrator trays fitted with the mesh sheet (no teflexx required). Mine took up about 4 trays. Dehydrate at 115F for 6-8 hours rotating trays every few hours (if you remember but otherwise not a biggie). Chips are done when crisp - allow to sit out for an hour or so until any residual 'heat' has left and place in tupperware or mason jars for storing. * If you can't find raw - it's okay to use roasted but go with unsalted. 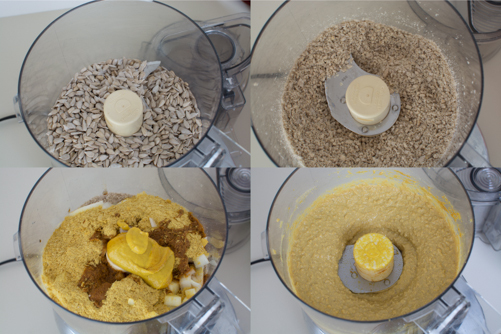 *Alternatively, ingredients could be blended all at once in a high-speed blender. 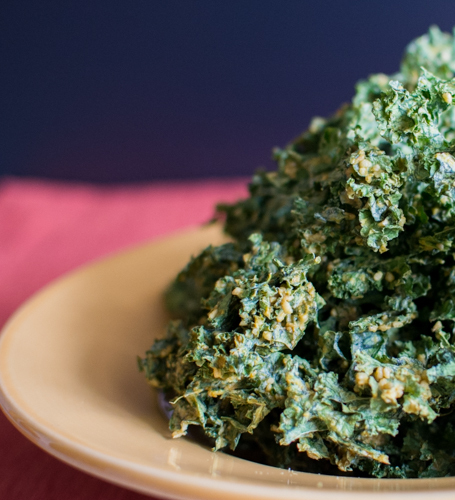 This recipe was so good that I was inspired to develop 4 other kale chip recipes using a similar base. They will roll out before the end of the year and I hope you enjoy them as much as I did making them! I made a lot because we’ll be using some of the chips in tomorrow’s recipe (get excited).